Bloodstained: Curse of the Moon was developed by Inti Creates (Azure Striker Gunvolt, Blaster Master Zero) and ArtPlay and was released as a bonus for backers of the Bloodstained: Ritual of the Night Kickstarter campaign. The game is a retro throwback inspired by the Castlevania series, with lots of parallels to Castlevania III: Dracula's Curse in particular, and it was developed in partnership with Castlevania series legend Koji “Iga” Igarashi. You take on the role of a demon hunter who is on a mission to defeat evil. On his journey, he meets up with three other individuals, each of whom offers to accompany him on his mission. Players can swap freely between these characters to make use of their abilities, allowing them to use their unique subweapons to combat enemies and differing movement abilities to access alternate paths. 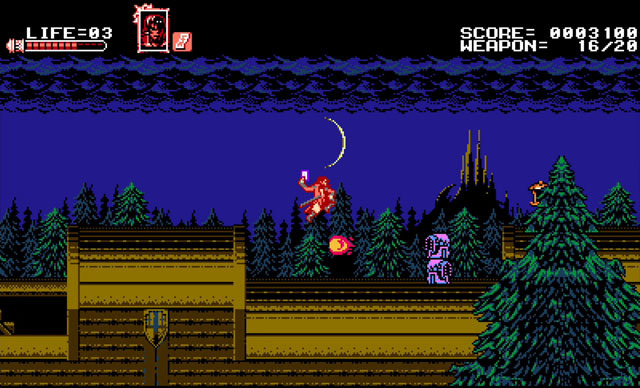 The game is stylistically similar to the Castlevania games of the 8-bit era, but offers crisp visuals, a widescreen presentation, and some impressive screen-filling boss encounters. The game is available for PC via Steam, PS4 and Vita via PSN, Switch and 3DS via eShop, and Xbox One via Microsoft Store. Check our coverage here.